In case you missed it, last month I shared how I handcrafted flowers for a Decoration Day style memory table for my own wedding. You can catch up on that post here. 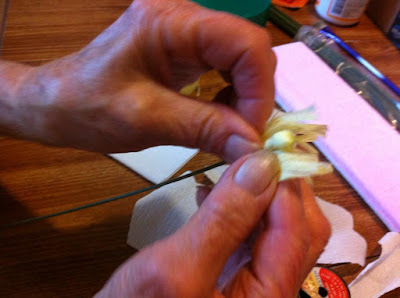 I also promised you a post on an authentically Appalachian crepe paper flower making session. So here it is! 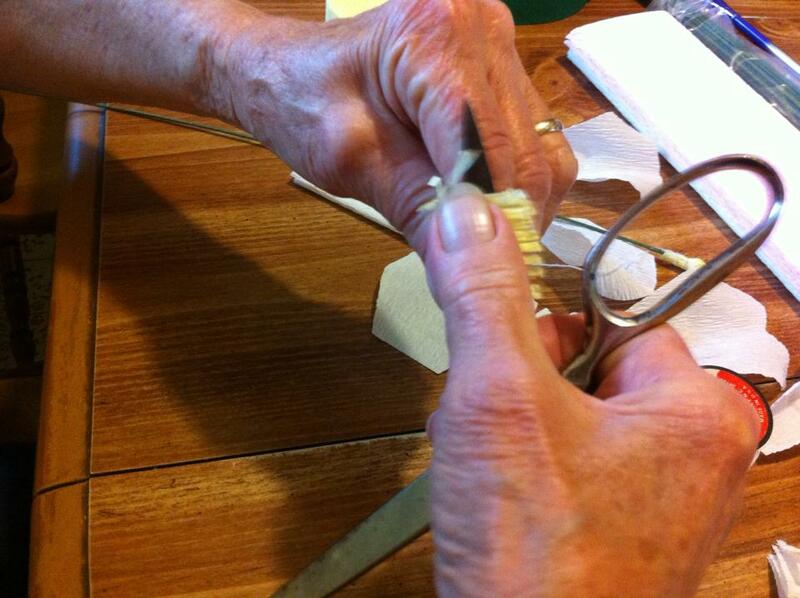 I recently sat down with my mom, a native of Eastern Kentucky, to find out just how this traditional Decoration Day handicraft was made in the mountains. 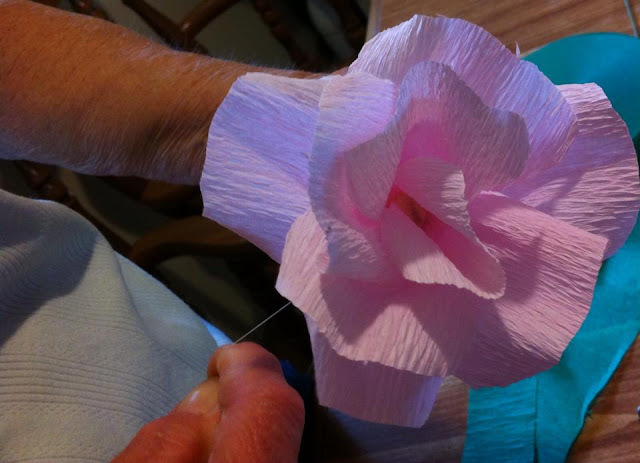 If you aren't familiar with the history of crepe paper flower making...years ago, in the mountains (and elsewhere) folks would spend hours crafting these paper blooms to decorate the graves of loved ones on Decoration Day (now known as Memorial Day). They would make them by the bucket full to honor loved ones who had passed. 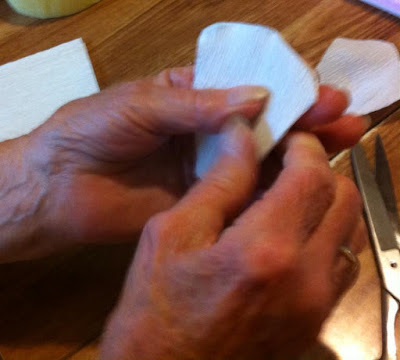 It is nearly a lost tradition now, but weddings make perfect occasions to revive this vintage Appalachian folkcraft...by adding an absolutely sweet, down home mountain theme to any wedding decor. If you'd like to give crepe paper flower making a try as wedding decor, or simply just for fun or old times' sake...here's my mother's "how to." You'll need crepe paper in floral colors of your choice, crepe paper in green for foliage and stems, cotton balls or small pom poms, thick wire (shish-kabob skewers also work well if you cannot find wire thick enough to add the needed stability), thin twine or string, scissors, and craft glue. 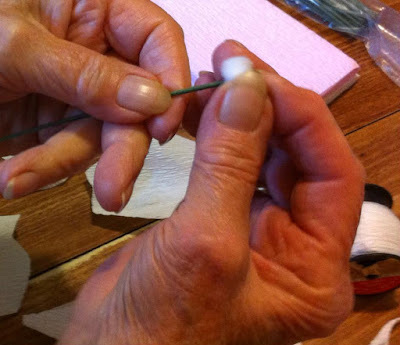 First, place a cotton ball on the end of your wire "stem" (if you are using a pom pom, you may need to secure with a little glue, or wrap the wire around the pom pom for stability). This cotton ball will be the center of your flower. 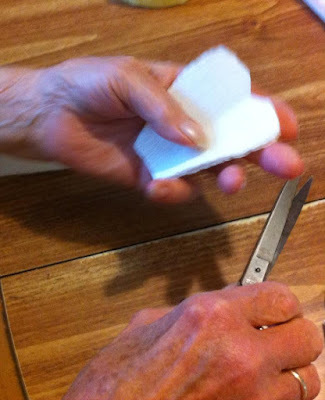 Next, cut a square of crepe paper large enough to cover the cotton ball with plenty to spare. We used yellow. My mother explained that this was the color they usually chose for the center of the flowers when she made them growing up in Appalachia. 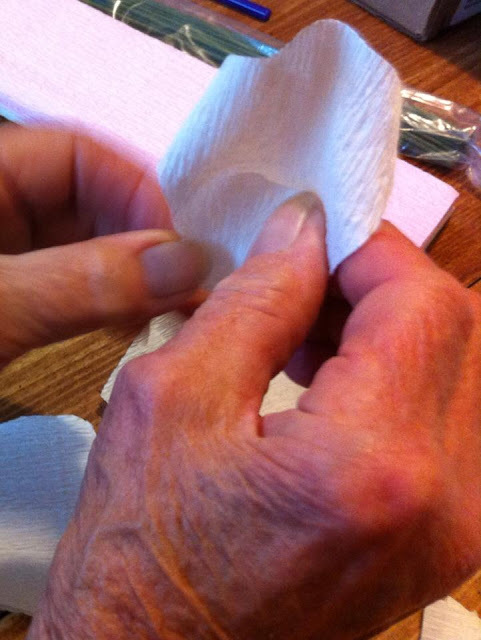 Next, cover the cotton ball with the square of crepe paper and wrap around the bottom of the cotton at the wire with a twist. Think of how a sucker or lollipop is wrapped and you've done it right! 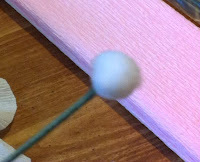 Next, take a lengthy piece of string (a couple feet should allow plenty to work with), and tie around the twisted portion of the crepe paper at the base of the cotton ball. 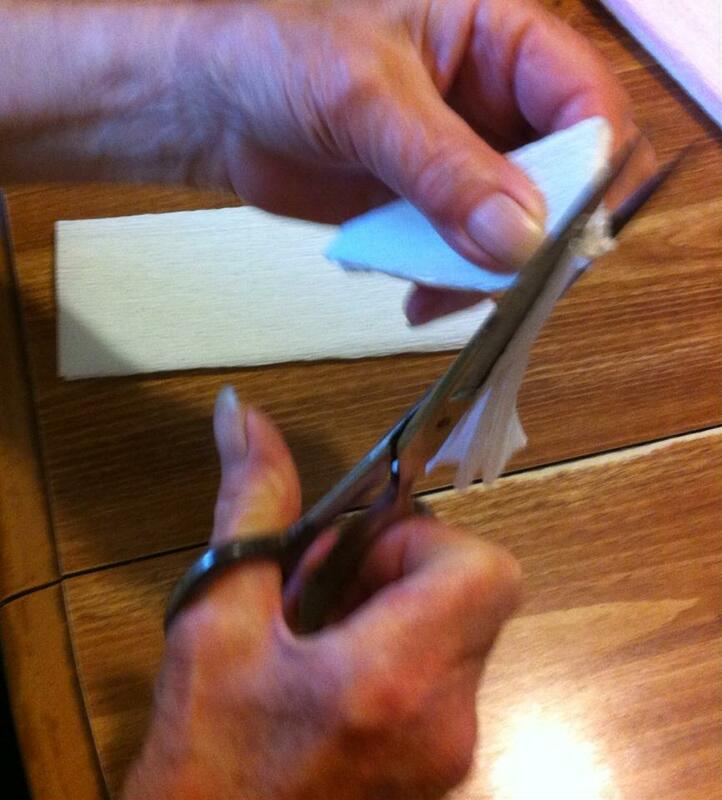 This string will be used to secure the petals you will be adding as well. 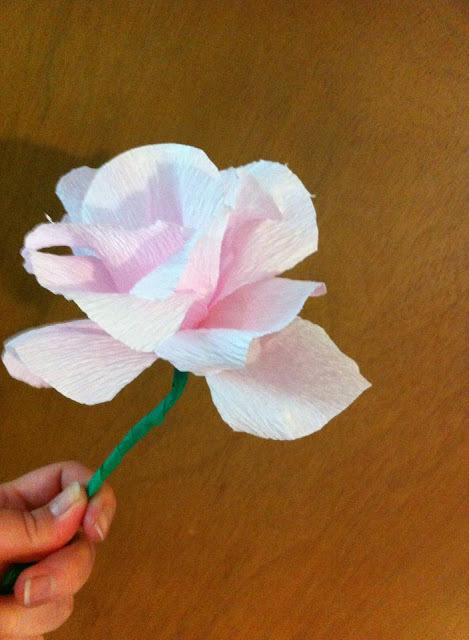 If you would like to make stamens for your flower center, use 3-4 layers of crepe paper in a size of 2-3 inches wide and long. On one side of the paper stack, cut fringe about halfway to two-thirds of the way down the square. 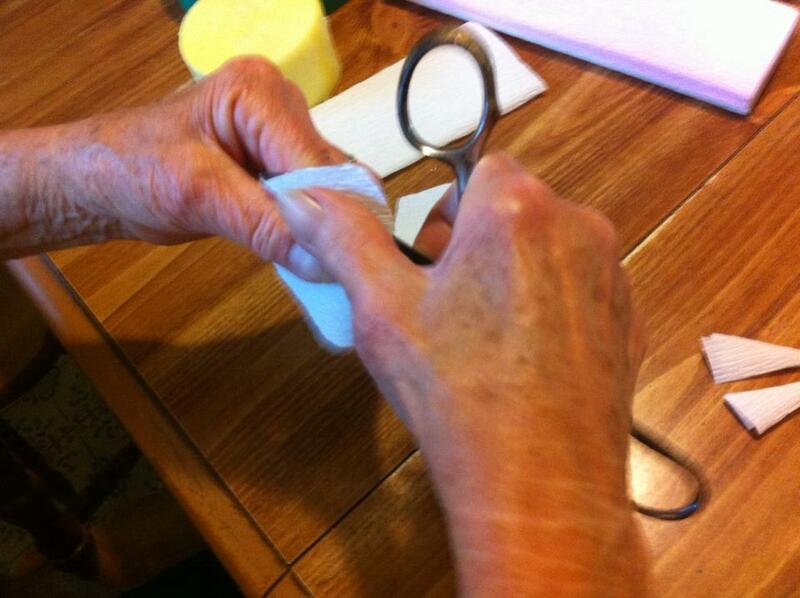 Then slightly curl the fringe with the edge of your scissors. 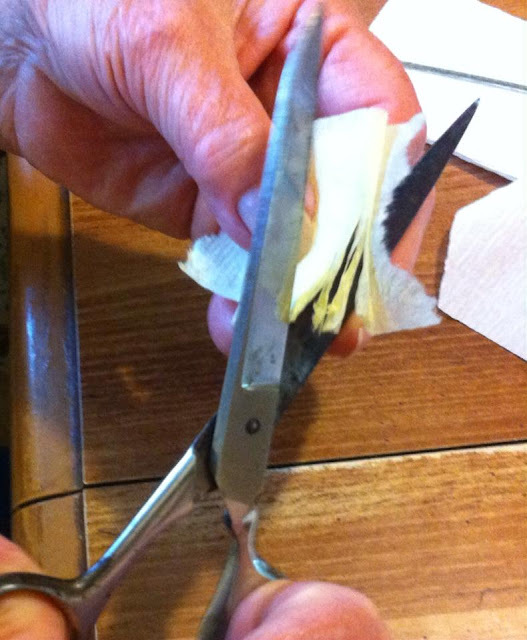 Wrap the uncut portion of the paper stack around the base of the flower center and wrap tightly with the string around the wire stem. 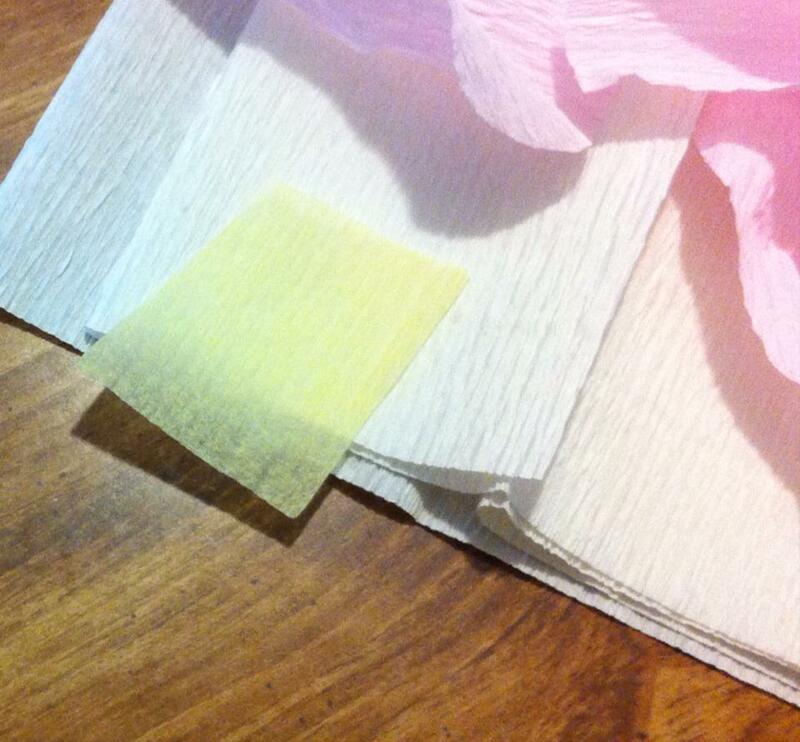 Next, you will be making the flower petals. 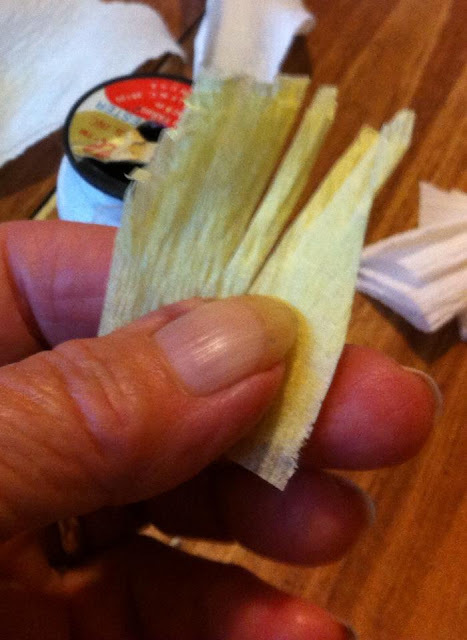 Take about 10-12 squares of crepe paper that are around 3-4 inches wide and long. Stack them on top of each other and fold them over in the middle so you can cut all the petals at one time. You can just freehand cut a petal shape of your choice, cutting along the unfolded portion of the stack. When you unfold the petals, you will have a pieces that are even on both sides. ...or this, depending on how you chose to cut your petal shapes. There is no right or wrong way to cut your petals, so use any shape you would like depending on the flower look you want. My mother informed me that most of the time they were trying to create roses when she was helping make flowers while growing up in Appalachia...but that may have varied throughout the region. 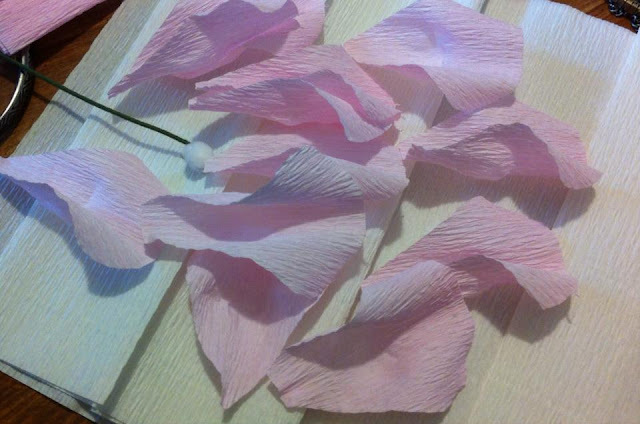 Next, you can shape your petals to make them curved and more realistic. 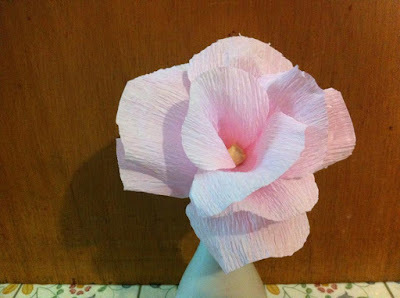 Crepe paper tends to stretch and hold its shape, so shaping the petals is fairly easy. 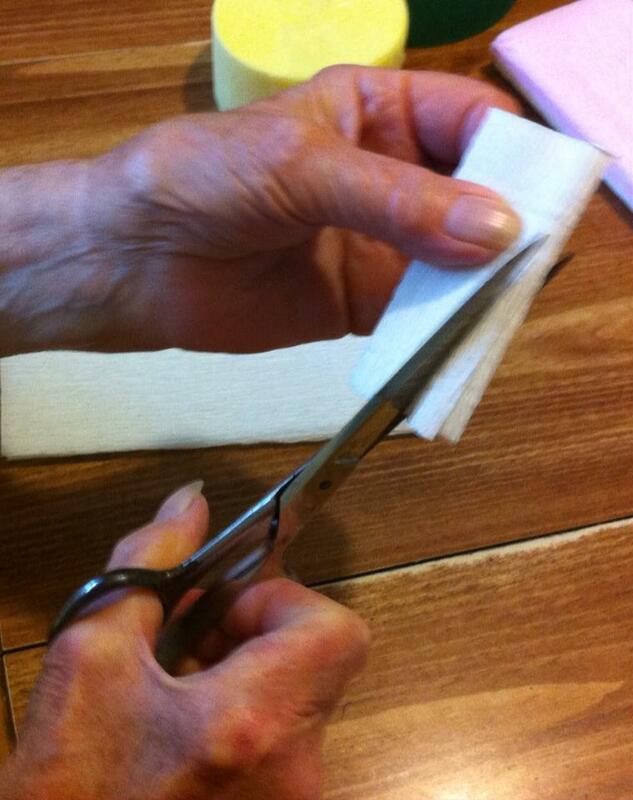 Start by gently curling over the edges of each petal with your scissors...in a way similar to how you would curl ribbon for gift wrapping. 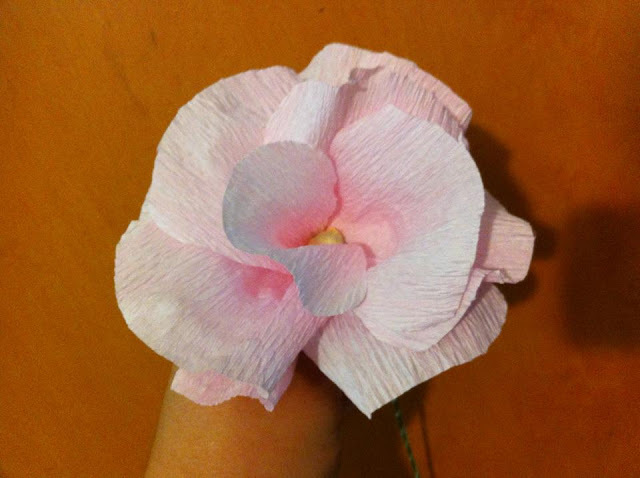 Then use your thumbs to make a depression or curve in the middle of the petal...giving it a more realistic appearance. 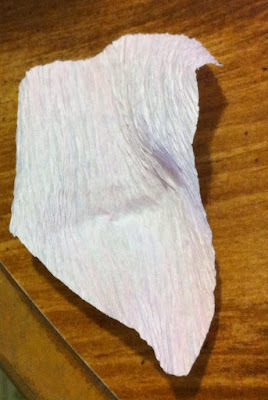 Your finished petals should look similar to this. Now you are ready to attach the petals to the flower center using the string. Place your first petal against the flower center and wrap the already attached string tightly around the base of the petal to secure it. You may need to wrap it a couple of times with the string to assure that it is secured. 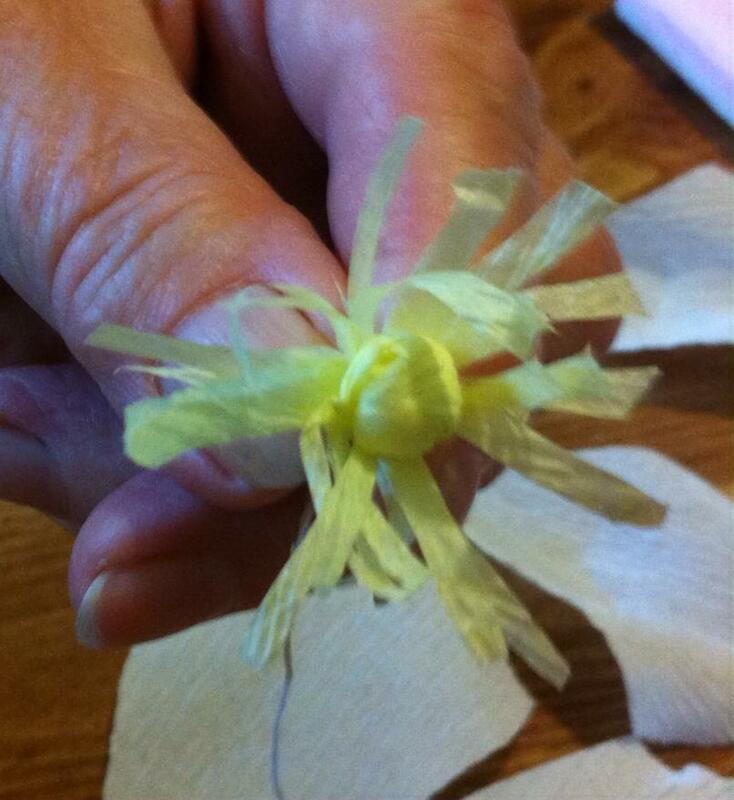 Continue to add and tightly wrap each petal to your flower with the string, making sure to offset the petals so you place each added petal under the end edges of the petals above it...not directly in the same spot as the petal that is above. When all your petals have been added, you can add leaves if desired. 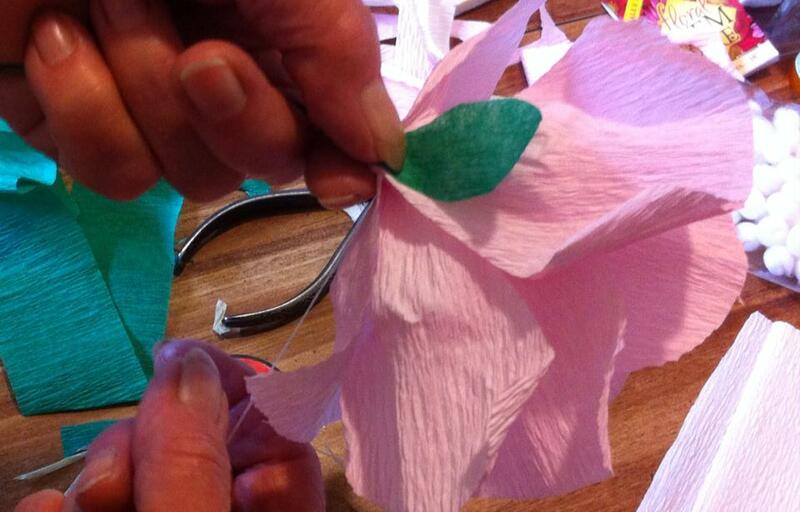 Freehand cut a leaf or two of whatever shape you desire and wrap around the base of your flower in the same way you wrapped your petals. After your leaves have been secured with the string, tightly tie off the string or wrap any excess string down the length of the flower stem. 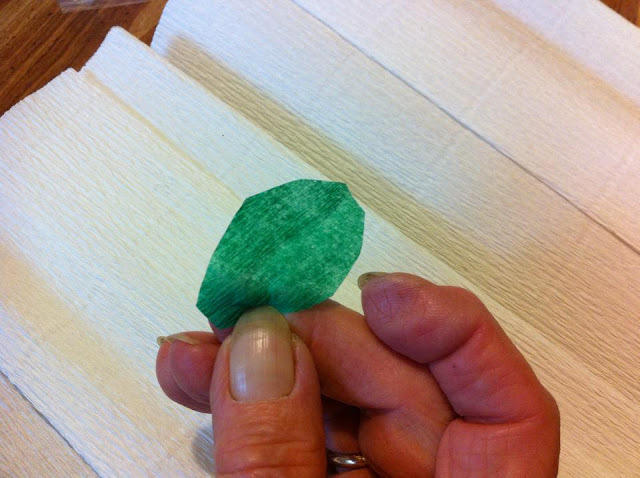 You can then cover the wire stem with a long, thin strip of green crepe paper. A length of green crepe paper streamer works well for this. If needed, use a little glue to help secure the crepe paper to the stem. 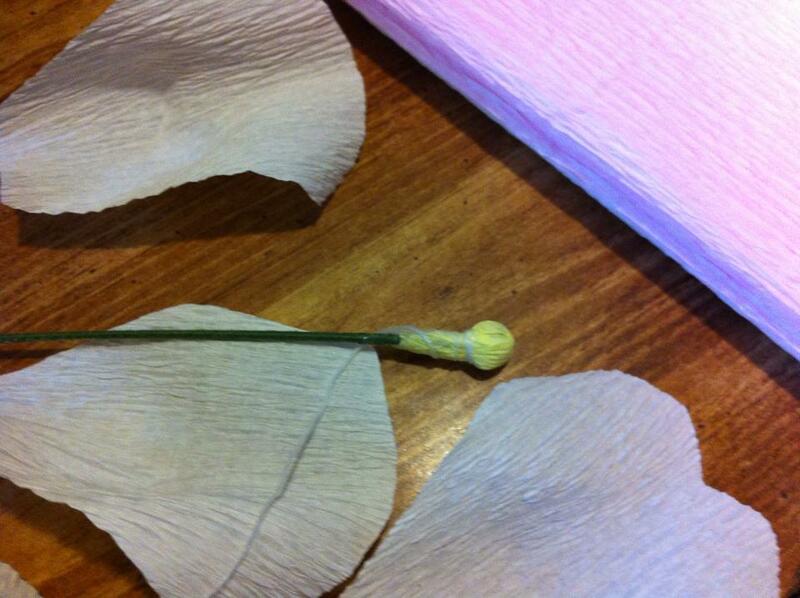 Here is a crepe paper wrapped stem when completed. 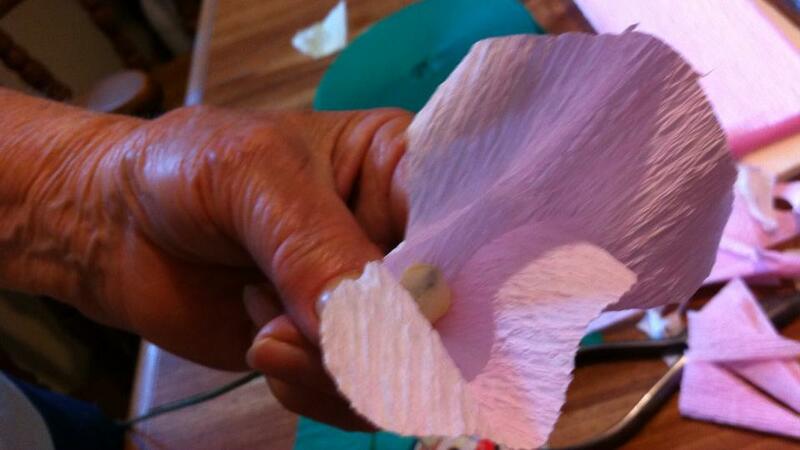 Once the flower is completed, if needed, by hand carefully reshape any petals that have become misshapen. And then you're done! 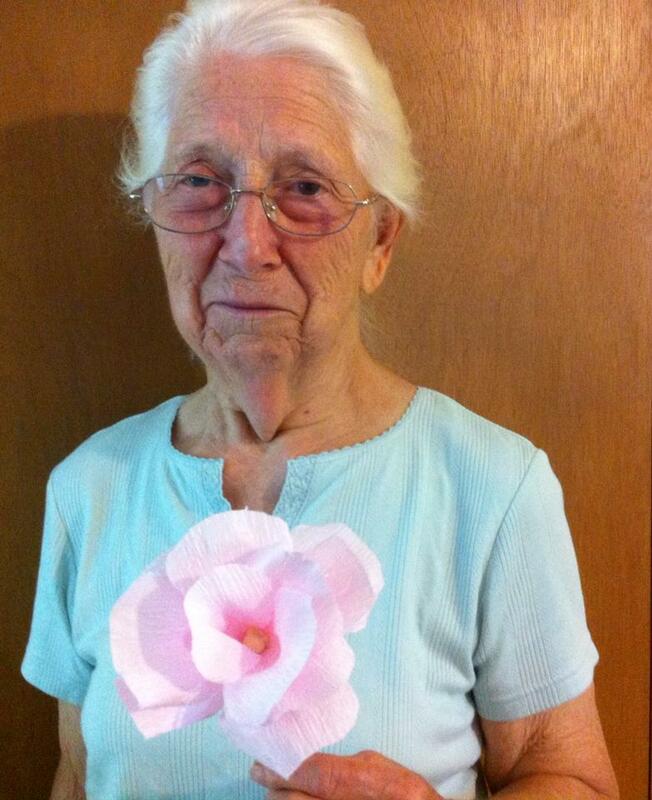 I had so much fun learning to make these flowers with my mom! If you know someone who used to make these Decoration Day flowers, go ask them to show you how they made them. It will make great memories for everyone involved...I promise! Well, if you're not the marrying kind (teehee), bear with me because next blog post I will share the third and final (for awhile) Mountain Wedding Series post. And, trust me (marrying kind or not), this one you won't want to miss! Even if you have no wedding on your horizon, you'll want to check it out....'cause it will be all about food! And let's face it, we've all got to eat! See you back here real soon!